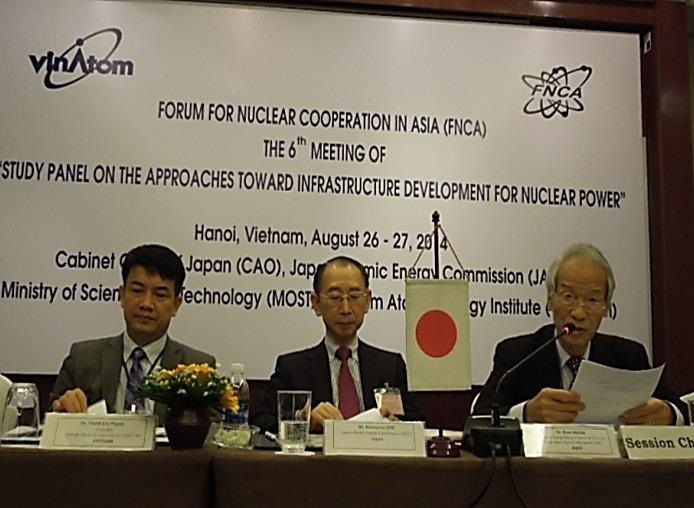 The 6th Meeting of "Study Panel on the Approaches toward Infrastructure Development for Nuclear Power" was held on August 26th and 27th, 2014 in Hanoi, Vietnam, co-hosted by Cabinet Office (CAO), Japan Atomic Energy Commission (JAEC) and Vietnam Atomic Energy Institute (VINATOM). 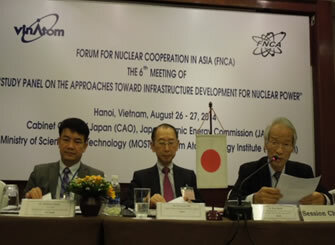 The Panel discussed Technical Support Organization (TSO), Small Modular Reactor (SMR), Emergency Preparedness Response (EPR), Stakeholder Involvement and so forth, and also exchanged the information on Vietnam's Nuclear Power Development, Update of the Accident at TEPCO's Fukushima Daiichi Nuclear Power Station and The New Basic Energy Plan of Japan. 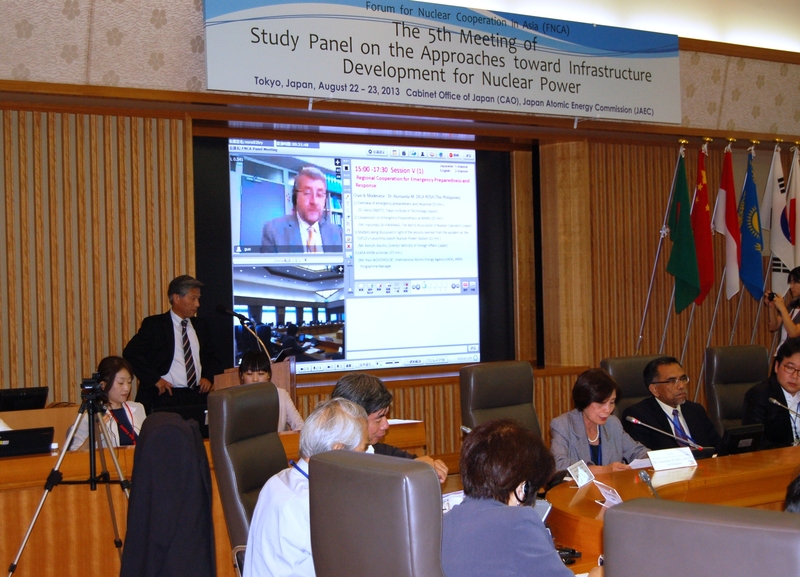 In each session, the participants exchanged and shared their information and experiences on nuclear power through the presentations by the experts from Japan Atomic Energy Agency (JAEA), National Institute of Radiological Sciences (NIRS), Central Research Institute of Electric Power Industry (CRIEPI) and IAEA, and also through the discussions including the case reports from the participating counties. The panel also discussed the future direction of FNCA study panel. 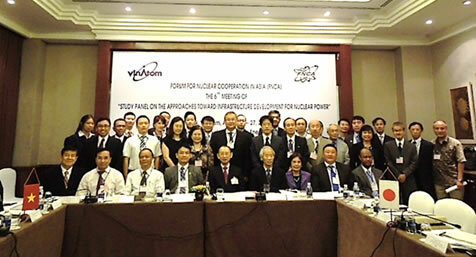 They have covered wide range of topics on infrastructure development for nuclear power, and have supported the participating countries to develop their nuclear power infrastructure for six years beyond the initial three-year plan. Now that almost all the key topics were covered, Japan proposed to review the future direction of the study panel and asked for comments from the floor. In response to this suggestion, admirations for the usefulness of the current study panel and suggestions to continue the panel on nuclear power infrastructure arose from several countries. The revision plan will be continuously discussed among the participating countries in preparation for the forthcoming FNCA Ministerial Level Meeting held in November. Dr. TRAN opened the Meeting with his remarks. 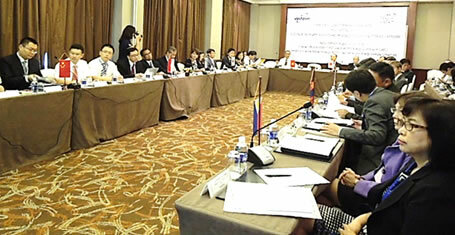 He stated welcome address and mentioned that ongoing Vietnam's NPP project should become successful. He also stated that it is important for us to apply lessons learned from Fukushima Daiichi NPS Accident. Finally, he expressed his hope for fruitful results of the meeting. Next, Mr. ABE delivered welcome remarks. He gave thanks to VINATOM for hosting this meeting. He also mentioned a primary role of JAEC is securing peaceful use of nuclear energy in Japan, which is distinguished from the role of Nuclear Regulation Authority (NRA) established after Fukushima Daiichi NPS Accident. He also appointed Mr. Kazuaki MATSUI, Senior Fellow, the Institute of Applied Energy (IAE) as a rapporteur, and the Meeting agreed. Participants at the meeting introduced themselves individually. Lastly, the Meeting agenda was adopted without amendments. 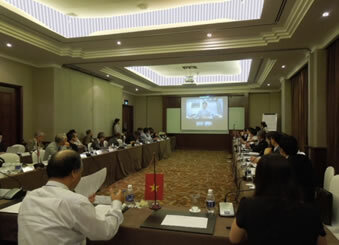 Dr. TRAN delivered a special presentation on "Vietnam's Nuclear Power Plant Development -Current Status and Future Plan". The presentation concluded that 1) Vietnam has introduced an ambitious nuclear power program (VNPP) including ongoing first two NPP projects (FS phase), 2) Vietnam needs to develop a sustainable nuclear power program, in which human resources and R&D are essential, 3) although the nuclear power program is a big challenge for Vietnam, they are moving forward towards solving the problems, and 4) international cooperation plays an important role in the VNPP, especially in human resource training in the forthcoming years. 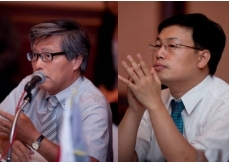 Some questions arose in the meeting regarding the construction plan for research reactors, the system for allocating their staff in Vietnam and other countries for training, the difference between feasibility study in Russia and Japan and the localization of NPPs. Mr. Toshihiko FUJII, Deputy Commissioner for International Affairs, Agency for Natural Resources &Energy, Ministry of Economy, Trade and Industry (METI), reported on the current status of TEPCO's Fukushima Daiichi Nuclear Power Station and also their efforts for remediation. Concerning decommissioning, some works are now in progress under the Mid-and-Long Term Roadmap towards the decommissioning. At Unit 4, fuel removal from the spent fuel pool will be accomplished around the end of this year. To cope with the contaminated water issue, the government of Japan has developed a basic policy for the fundamental settlement of the issue and has been taking measures step by step based on the policy including measures for contaminated water management such as implementing the land-side impermeable frozen wall for leakage into the port of the site. The new basic energy plan of Japan was presented by Mr. FUJII. Current energy situation in Japan is quite serious primarily due to rising electricity rate owing to the increase of natural gas import as a result of suspended NPPs. Accordingly the new plan authorized by the Cabinet in April 11, 2014 has positioned nuclear power as important base-load power source as well as low carbon and quasi-domestic energy source and stated clearly that seeking the understanding of relevant municipalities and the international community Japan will promote the nuclear fuel cycle policy. There were several Q&As arisen on the two presentations such as challenges for the restart of NPPs in Japan and possible influence of Fukushima NPP accident on Japan's nuclear cooperation with the international community. Mr. Masaki OKUBO, Former Counseling Expert of Japan Nuclear Energy Safety Organization (JNES) introduced a history of TSO in Japan, tracing a path from the start of nuclear energy development in 1954 to the establishment of Japanese NRA in 2012 and merging JNES, Japanese TSO, into NRA in 2014. Next, efforts and challenges to build TSO in Indonesia were reported by Dr. Anhar R. ANTARIKSAWAN, Deputy Chairman of National Nuclear Energy Agency of Indonesia (BATAN). No official TSO exists in Indonesia for now, and BATAN is undertaking the role of "TSO in some ways. Besides, BAPETEN as a regulatory body has an internal TSO of BAPETEN." As the nuclear activity, especially concerning NPP increases, the establishment of independent TSO should be considered. Lastly, Dr. LEE Youngeal, Wolsong Inspection APM, Korea Institute of Nuclear Safety (KINS) spoke on the outline of Korea's TSO. The nuclear safety regulation in Korea is performed by KINS, an expert organization under the entrustment from the Nuclear Safety and Security Commission (NSSC), the regulatory authority. KINS as TSO has been efficiently conducting the regulatory activities such as safety review. KINS is also cooperating on the various aspects with many other countries and playing a key role in international nuclear community. There were questions and discussions arisen on the relationship between research organization like KAERI and TSO like KINS, the changes after JNES was merged into NRA and so on. Dr. Mochammad Hadid SUBKI from the Department of Nuclear Energy, International Atomic Energy Agency (IAEA) reported on small modular reactors in terms of safety, economy, waste management and non-proliferation. The presentation for advanced SMRs such as Integrated Pressurized Water Reactor (IPWR) and multiple modules focused on some impediments to deploy novel designs that need to be resolved through the test and qualification of components and equipment, R&D, training and international collaboration. Mr. XU Bin, Deputy Chief Designer of ACP100, Nuclear Power Institute of China (NPIC) introduced China's SMR Design features, potential advantages and challenges. He reported that the typical SMR in China, ACP100 which is developed by the joint research team composed with NPIC and China Nuclear Power Engineering (CNPE), which are both subordinate to China National Nuclear Corporation (CNNC). ACP100 is an innovative PWR based on existing PWR technology, adopting "passive" safety system and "integrative" reactor design technology. Mr. BAE Kyoo Hwan, Principal Researcher, Korea Atomic Energy Research Institute (KAERI) also made a presentation entitled "Korean SMR-SMART, New Option for Nuclear Energy". SMART (System-integrated modular advanced reactor) is an small-sized integral type pressurized water reactor with multiple applications, such as electricity generation, seawater desalination, electricity generation and district heating, developed by KAERI for 15 years aiming to export it to countries with small electric grids and water supply issues. Lastly, the same topic entitled 'Japan's SMR Design-its features, potential advantages and challenges' was presented by Dr. Xing L. YAN Group Leader, Heat Application System Design, Nuclear Hydrogen and Heat Application Research Center, Japan Atomic Energy Agency (JAEA). Gas turbine High Temperature Reactor 300 MWe (GTHTR300) is a multi-purpose, inherently-safe and site-flexible SMR that JAEA is developing for commercialization. The reactor system combines a high temperature gas-cooled reactor with helium gas turbine to generate power while allowing such cogeneration as hydrogen production, desalination and steelmaking.. The discussion of SMR was made focusing on SMR technologies such aspects as safety, economy, and radioactive waste management. Building regional Networks -Overview of recent activities in the world was presented by Dr. Syahrir, Head of Radiation Protection and Environment Division, National Nuclear Energy Agency (BATAN). The presentation included world EPR systems, namely 1) UK RIMNET (Nuclear Radiation Monitoring and Nuclear Emergency Response System), 2) France CEA-CMT (Crisis Management Team) and ASN (French Nuclear Safety Authority) responsibility, 3) Sweden SSM (Swedish Radiation Safety Authority), 4) EU ECURIE (European Community Urgent Radiological Information Exchange), 5) Korea NEMC (Nuclear Emergency Management Committee) and 6) IAEA Convention, Safety Standards and RANET (Response and Assistance Network) and ANSN (Asian Safety Network) EPR-TG (Topical Group). He lastly showed possible areas of regional cooperation on EPR such as notification of accident information and early warning through IAEA and directly. Next, Dr. VUONG Thu Bac, Deputy Director, Center for Environmental Radiation Monitoring & Impact Assessment (CERMIA), Institute for Nuclear Science and Technology (INST), VINATOM introduced "Vietnam's Approach to develop a Nuclear Emergency Preparedness (Status and Challenges)" and made the conclusion, namely that 1) NREP&R (Nuclear & Radiological Emergency Preparedness & Response) is a quite hard and complicated issue, 2) Building up & developing national NREP&R Plan are very necessary and important since Vietnam's national capabilities for NREP&R are still very weak in all aspects, 3) Vietnam is actively preparing necessary things to introduce nuclear energy and its application into Vietnam successfully, and 4) Vietnam is following closely the IAEA's recommendations and would like to learn and to share experiences from all of other counties. He also expressed a request to receive assistance and support from the IAEA as well as developed countries as proposal for meeting practical demand of NREP&R in Vietnam. Dr. Keiichi AKAHANE, Head of Medical Exposure Research Promotion Section, Medical Exposure Research Project, National Institute of Radiological Sciences, Japan (NIRS) delivered a presentation on Dose Estimations for Fukushima Residents after the Fukushima Daiichi Nuclear Power Plant Accident. The estimation of external exposure based on the survey data such as the behaviors of the residents and the dose rate maps was performed by the calculation system developed by NIRS. As for internal exposure, the estimation was quite difficult due to short half-life of 131-Iodine (about 8 days) in early stage of the accident so the available measurement data of the stage after the accident were limited. The internal doses have been estimated by the experts in this field based on the data of thyroid measurements, whole body counter measurements, and atmospheric dispersion simulations. In addition to Dr. AKAHANE's presentation, Dr. Hideo TATSUZAKI, Head of Medical Section, Emergency Medical Assistance Team of NIRS gave an explanation on Need for Radiation Emergency Medical Preparedness. The presentation emphasized that radiation emergency medicine is a special field in medicine to deal with patients suffered from radiation exposure or contamination with radiological substances. This includes dose assessments and radiation safety among others. Education and training of medical staff to prepare for these accidents are necessary. The NIRS has Radiation Emergency Medical Assistance Team (REMAT) to assist local professional in these occasions if requested. In the discussion about overview of the recent activities of the regional network built in the world, there were comments and questions on decision making process for evacuation and a long term medical care such as thyroid check for children and psychogenetic care. Dr. Shin-etsu SUGAWARA, Research Scientist, Socio-economic Research Center, Central Research Institute of Electric Power Industry (CRIEPI) introduced overview of stakeholder involvement in France, UK and Japan and also differences in local stakeholder involvement among three countries, such as the ways of institutionalizing (by law in France, no legal binding scheme in UK and Japan) and identifying stakeholders (within the emergency planning zone in France, flexible dependency on issues and siting areas in UK). As a model case, a success story of stakeholder involvement in nuclear power projects in Fukui Prefecture, Japan was introduced by Dr. Sueo MACHI, FNCA Coordinator of Japan. The presentation emphasized 1) Clear-cut policy of Fukui Pref. Gov. such as safety, acceptance by the people and enhancement of welfare, 2) Safety assurance as prerequisite of hosting nuclear power plants such as establishment of safety division in Fukui Pref. Gov. and 3) Enhanced communication with stakeholders in Fukui Prefecture. Next, Ms. Kristina PODSHIVALOVA, Head of PR Department JSC NAC Kazatomprom, also reported on Kazakhstan's experiences and activities to advance local community's understanding of uranium mining facilities. Nowadays the work for overcoming fear of population and increasing of loyal perception of uranium mining companies' activity is carried out in several areas. Primarily this is the work with governmental circles which is carried out by the Atomic Energy Committee of the Republic of Kazakhstan and its subordinated institutions. This work also belongs to non-governmental ecological institutions. The flagman in this area of activity is Nuclear Society of Kazakhstan. The followings were discussed, namely 1) institutionalization of stakeholder involvement by law versus no legal binding scheme and 2) dissemination of nuclear information to the public including insufficient dissemination internationally from Japan. Session has concluded that information presented in this meeting was useful for countries to intend developing nuclear power. The proposal for discussing the new objective and scheme of the 4th phase was made by Dr. MACHI. Objective and structure of the new 4th phase: A platform for exchanging views and sharing experiences on the national policy and international cooperation for nuclear energy development (nuclear power and nuclear application). Senior level officials and FNCA Coordinators are expected participants. A Study Panel and a Coordinator Meeting will take place for three days back to back. Multiple participant countries gave positive comments to the proposal while emphasizing value of the current Study Panel for nuclear power and desire to continue that. The proposal will be continued to discuss and also concluded at the upcoming Ministerial Level Meeting. 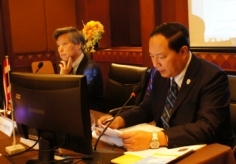 As a chair's summary, "Wrap-up of the 6th Study Panel Meeting" was presented by Mr. MATSUI. Lastly, Dr. CAO Dinh Thanh, Vice President of VINATOM and Mr. Nobuyasu ABE gave their impressions on the meeting and closing remarks as well. The meeting was closed. Advisor to Wakasawan Energy Research Center,Fukui Pref. Gov.